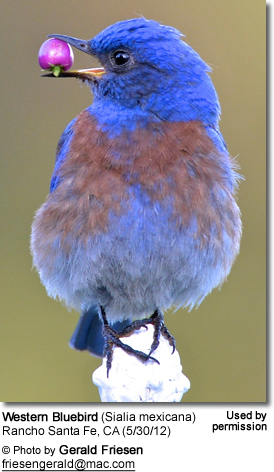 Bluebirds are very beneficial birds, as they consume large amounts of insects. Bluebirds used to be very common, but loss of habitat, pesticides and predators have taken their toll on these beautiful creatures. In providing food, water, shelter and a place to raise their young right in your garden - the four essential components of a successful "backyard habitat" - you are not only helping these birds survive and possibly thrive, but you will be able to enjoy seeing and experiencing them in your backyard. It is important to note that Bluebirds don't usually eat seeds and won't visit regular bird feeders; however, they do enjoy feeding stations that offer mealworms, peanut butter and raisins, or berry or insect suet. They like the fruits and berries of elderberry, dogwood, bayberry, red cedar, sumac, Virginia creeper, holly, blueberry, junipers and hackberry. Planting trees and shrubs that hold berries and fruit into the winter may help protect them from any food shortages at a time when insects aren't readily available. You can also try offering chopped fruit, berries and chopped peanut kernels in platform feeders. At any time of the year, it is important to avoid using chemical / toxic pesticides as these would eliminate their main food source - insects. Also, the toxins are likely to settle on the plants they feed on and poison them. Bluebirds nest in natural nesting sites, such as natural tree cavities and old woodpecker holes. So don't remove any dead trees that might provide such nesting opportunities. However, these birds will often readily accept nesting boxes of appropriate dimensions. At a time when a lot of their natural habitat is converted for human uses (such as housing, infrastructure, agriculture, etc. ), artificial bird houses hold an important role in slowing down or possibly reversing declines in the numbers of Bluebirds. 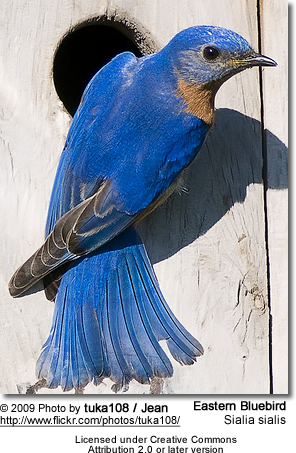 Bluebird boxes should be mounted no higher than 4 - 5 feet above the ground. They should be located away from buildings and dense wood. Ideally, it should be an open area with scattered trees or low shrubs. Some conservation groups or individuals concerned about the decline in the numbers of Bluebird have implemented what is commonly referred to as "Bluebird Trails." This entails putting up lines of bluebird houses. Ideally, these should be monitored and maintained. Sometimes mites will invade the nest box and drain the chicks of blood, which will result in death if nothing is done about the infestation. Or predators will start to widen the entrance opening to get to the chicks (which is why it is so important to reinforce the entrance hole). By keeping an eye on these nest boxes, one can intervene, if necessary. Mount boxes in pairs at least 100 yards apart (about the distance of a football field). The entrance hole should be large enough to allow Bluebirds to enter, but too small for larger birds to get in to nest or to prey on any eggs or chicks inside the box. It is also helpful to place another nest box within 10 to 20 feet from the other, with a larger entrance hole - to give aggressive nest competitors an alternative. This will give the Bluebirds a better chance of raising their young without constantly having to fight aggressive nest competitors. The entrance on the Bluebird nestbox should be about 1.75 inches (4.5 cm) in diameter. The entrance hole should be about 6 inches (15 cm) above the floor of the box. Make sure to face the box away from winds and in a place that is protected from direct sun exposure to protect the nest occupants from overheating. The nest box should be within 100 feet of the tree to give fledglings a perch to fly to. It is safer for them to fly to a perch rather than land on the ground, where they are more at risk of being preyed on. You could help pairs by providing nesting materials, such as grasses - or the lint from your dryer works great, too. After brushing your dog's or cat's hair, you can collect the hair from the brush. Shorter hair is better than longer hair, since fine hair can get caught around their feet / legs and restrict blood flow, which can result in limp amputation. So it's best to cut any longer hair to less than an inch. Wild birds will eagerly use the hair to line their nests with. Nesting material can be provided in an empty suet cage or simply placed in an area frequented by wild birds. Offer plenty of water sources in your backyard habitat. Birds in general are attracted to running water, such as shallow water fountains. However, bird baths work well as well. You don't want the birds to become sick. You can use a power sprayer to clean off any dirt and any bird droppings. Make sure to change the water several times a week and scrub as necessary. Disinfect the water fountain / bird baths and bird feeders at least once every two weeks with bleach. Be on the look-out for bird mites. Wild birds often carry them and in visiting our bird feeders will pass them on to other birds. If you see little moving specks in the seed, it's best to discard the seed, or at the very least freeze them in for a week or longer. I have learned that it is best to keep bird seed inside (for example, in the garage) -- as they get easily infected outside. If you believe the area around the bird feeder is infected, change the location of the bird feeders temporarily. Spray any infected areas with "soapy" water using a water hose with a fertilizer attachment, putting the dish washing liquid into the "fertilizer" compartment. You could use Dawn dish washing liquid, as it is the safest. For pest control, the "blue" Dawn works best. Never ever use the anti-bacterial kind, as it toxic for birds. The soapy water should take care of any mites and ants. (Ref. Non-toxic Pest Control - Green and Healthy Website). Make sure that you are not spraying any animals. The second step in ridding any areas of bird mites is dusting them with Sevin Dust (5 percent), which is readily available at most stores. Bluebird numbers are declining due to loss of suitable habitat and predation of their nestlings by snakes, cats, raccoons and non-native bird species, such as Common Starling and House Sparrow which have been observed entering a nestbox and pecking the nestlings to death. House Wrens may enter a bluebird's nest box, poke small holes in the eggs and sometimes toss some or all of the eggs to the ground. Additionally, these birds also compete with bluebirds for nesting locations. Bluebirds are protected under the US Migratory Bird Treaty Act. It is illegal to touch or handle bluebirds, their nests, eggs or chicks without a special permit. If assistance is needed, contact your local licensed wildlife rehabilitation center.